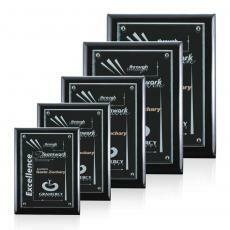 Recognize your employees for their efforts with something exceptional and timeless: acrylic plaques. 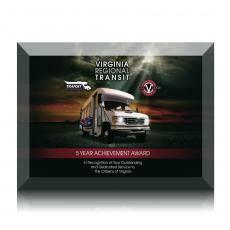 Present our custom acrylic awards during annual award shows, employee of the month events, and other banquets. Awards.com has many plaque options available in different styles. Each custom acrylic award features beautiful design touches like silver or gold trim. Our plaques boast clean, corporate designs that businesses will appreciate and want employees to proudly display at their desks. We can add free, custom engravings to any acrylic plaques you order so every award stays on brand. Personalize each plaque with recipient's name, award title, and any other information you wish with three font options. Artwork or logos can also be engraved onto acrylic plaques. Within one to three days of ordering, we’ll provide you with the award design for your approval. Rush ordering services are available if you need a quicker turnaround. At Awards.com, orders over $500 are eligible for free shipping in the continental U.S. Whether you're getting acrylic plaques made for an awards banquet or a workplace anniversary you'll have something employees will be proud to mount on their wall or display on their desk. Recognize your top employees and order acrylic plaques today. We guarantee you’ll be satisfied with your custom acrylic awards orders. Contact us at 800-4-AWARDS today if you have any questions. $105 - $210| Sizes: 10.5"x13", 12"x15", 7"x9", 8"x10" & 9"x12"
$110 - $130| Sizes: 8"x10" & 9"x12"
$85 - $285| Sizes: 11"x13", 12"x15", 16"x20", 5"x7", 7"x9", 8"x10" & 9"x12"
$155 - $235| Sizes: 4"x6.5" & 6"x10"